A wooden scultpure of an airman commemorates the Allied aircrew, ground support and ancillary staff of the Royal Australian Air Force (RAAF), Royal Air Force (RAF) and the Netherlands East Indies Air Force (NEIAF) who operated from the Moruya Airfield during World War Two. 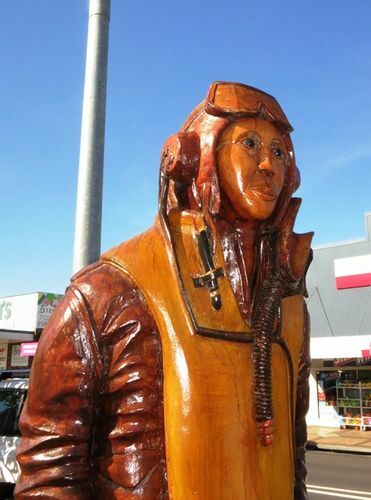 The sculpture is carved from life and is of Captain Gus Winckel, one of the Netherlands East Indies Air Force pilots who flew out of Moruya although his main base was Canberra. He moved to New Zealand after the end of World War Two and came back to Moruya to enable the statue to be carved and attend the dedication. The Air Raid Tavern was evidently the favourite recreation place of RAAF and NEIAF personnel during the war. reconnaissance, coastal shipping protection and rescue. were lost at sea from submarine attack. East Indies squadrons operated from Moruya. other works are a prominent feature of Moruya Township.